You have to hand it to the Rolling Stones. In their sixties, with many dozens of world tours under their belts, and with album sales that will never top those of their peak, they are still out there doing it. So how to you top everything you've done before when you have done so much? 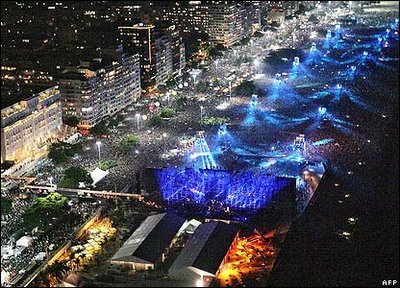 You go to one of the biggest, densest urban centers of the world, one with a reputation of loving to party, and you hold a free concert. And the you make the venue big enough to accomodate all that show up. And then a million people show up. Hey-SOOS! That's a lot of people! A MILLION people! I've been to a concert with, I beleive it was 40,000 people, and THAT's nuts. Now multiply by 25. Crazy. Way to go Stones. Nice topper. What's next? What did you do today daddy? I'm excellent at being mediocre! Is that a PSP in your pocket, or.....?